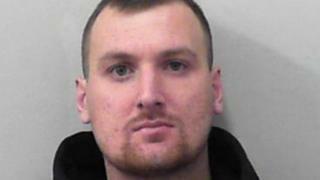 A man has been jailed for 12 weeks for his involvement in violence that broke out at a game between Bristol City and Swansea City. Ryan Greenslade, 26, of Brislington, Bristol, was also given a six-year ban from attending all matches in England at Bristol Magistrates' Court. Trouble flared at the match at Ashton Gate on 2 February. A second man is due to be sentenced at a future date and a third will appear in court next week. Greenslade had earlier pleaded guilty to causing fear or provocation of violence. Avon and Somerset Police said there was disorder within the ground and objects were thrown by each group of supporters. There was also further disorder after the match in the nearby Greville Smyth Park. Three police officers needed medical attention and a dog was injured. Det Insp David Lewis said: "This positive result demonstrates our commitment to dealing robustly with those involved in football-related disorder." He added the force was continuing to identify suspects through CCTV footage.